SOMETHING had to give when the Plate specialist met the Plate specialist in the final of the consolation competition at Fareham Snooker Club. EASB Regional Junior Tour player Canberk Benning (pictured left) defeated Cameron Holt 2-0 to claim the knockout trophy for non-qualifiers from the group stages at the seventh leg of the Cuestars South of England Under-21 Gold, Silver and Bronze Tours. 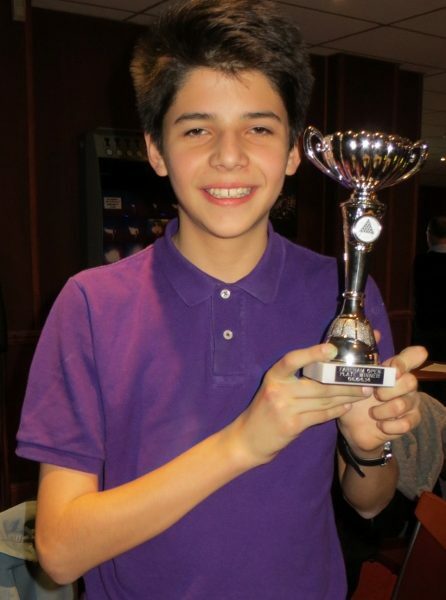 For 15-year-old Benning (Jesters, Swindon), it was a third Plate final of the season and a second victory. But for Holt (Liberal Club, High Wycombe), it was a third Plate final of the season and a third defeat. PRELIMS: Bradley Leishman (Stoke SC, Gosport) beat Connor Benzey (Chandler’s Ford SC), Canberk Benning (Jesters, Swindon) beat Ally Pollard (Salisbury SC), Matt Gillon (Stoke SC, Gosport) beat Liam Ashman (Player’s, Westbury). QUARTER-FINALS: Callum McDonald (Salisbury SC) beat Keegan Reed (Salisbury SC), Benning beat Leishman, Sam Warren (Chandler’s Ford SC) beat Gillon, Cameron Holt (Liberal Club, High Wycombe) beat Connor Shaw (Greenbaize, Bournemouth). SEMI-FINALS: Benning beat McDonald, Holt beat Warren. FINAL: Benning beat Holt 2-0. ← King John the VIII?